Asbestos Floor Tile: Is It Safe to Remove on Your Own? Unlike many asbestos-containing materials, vinyl asbestos flooring is generally safe to be around. But that changes as soon as you decide to remove it. Vinyl is a type of plastic that has long been a popular material for floor tiles and sheets. Old vinyl products that contain asbestos remain in many buildings across the U.S., creating a hazard for contractors and do-it-yourself renovators. Working with asbestos flooring can release toxic dust. Lack of awareness in the past has led to many workers suffering from terrible diseases today such as mesothelioma and asbestosis. Workers must take many precautions to remove asbestos floor tiles safely, and it is always safest to leave asbestos removal to qualified professionals. What Makes Asbestos Flooring Dangerous? Asbestos is a toxic mineral American manufacturers once mixed into many building materials. When these old materials are disturbed, they release dust that can make people sick later in life. Asbestos is fibrous, meaning it can be pulled apart into a soft, woolly consistency. Mixing asbestos fibers into building materials makes them stronger and more heat resistant. This is why asbestos was a popular additive in vinyl flooring products for much of the 20th century. Unfortunately, inhaling asbestos dust can lead to several serious diseases. When you breathe in microscopic asbestos fibers, they can get stuck in your body forever. The human body cannot dissolve asbestos. Instead, the asbestos fibers may eventually cause the buildup of scar tissue or genetic changes that lead to cancer. The asbestos industry covered up the dangers of asbestos for decades. By the 1970s, however, the medical evidence had piled up. Thousands of tradesmen who spent their careers working with asbestos materials have died of related diseases. Even though the use of asbestos is now limited in the U.S., thousands still die every year because of past uses of this toxic mineral. It is safest to assume that any flooring material put down before 1980 contains asbestos. Without a manufacturer’s label, you can’t tell whether a product has asbestos in it just by looking at it. You can find out for sure by having an asbestos-abatement professional inspect the material. You can also mail a sample of the flooring to a lab for testing. Asbestos materials are sorted into two categories depending on how dangerous they are. Friable materials are easy to break or crumble by hand. Friable asbestos materials are very dangerous because they can easily release toxic dust into the air. An example would be old asbestos pipe insulation. Nonfriable materials are durable. These products keep asbestos fibers safely contained as long as the materials are not damaged. An example would be a floor slab made from asbestos cement. When vinyl asbestos flooring is crumbling or damaged, it is considered friable. In this case, it needs to be removed very carefully to avoid asbestos exposure. But when vinyl asbestos flooring is in good condition, it is considered nonfriable. That means it is safe to walk on but not safe to scrape, sand or use power tools on. In many cases, the best thing to do about vinyl asbestos flooring is put a new layer of flooring on top of it. You could also seal it with a coat of epoxy floor paint. Both these options will keep the asbestos trapped in the floor. Just keep in mind the asbestos will still be there if someone does demolition or renovation work in the future. 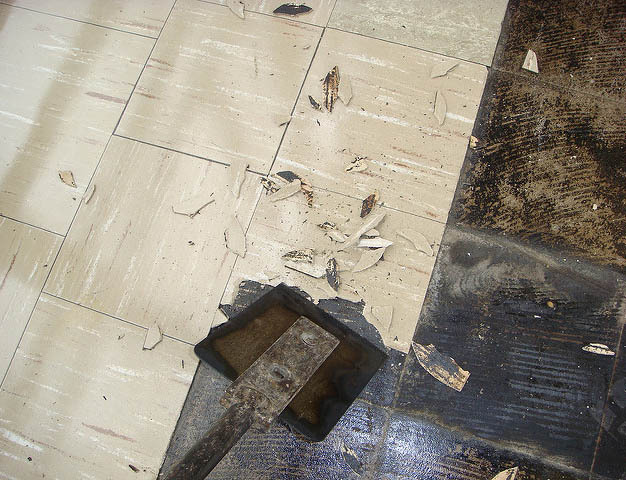 If you break the flooring into pieces while removing it, you have effectively turned it into a friable material. Even if the vinyl flooring is pulled up intact, the old adhesive underneath may also contain asbestos. It is always safest to leave asbestos flooring removal to asbestos-abatement professionals. Workers need protective gear to prevent asbestos exposure, and they must follow special procedures to avoid contaminating the whole building. Generally, the law requires licensed professionals to perform asbestos removal in commercial buildings. Some jurisdictions allow private homeowners to remove asbestos materials on their own, but DIY asbestos abatement is never recommended. Before you remove asbestos flooring yourself, you must check the state and city regulations for asbestos removal and disposal. To do the job without putting yourself or your household at risk, you need to take the same precautions as the professionals. Plastic sheets to seal off the work area. To keep asbestos contamination from spreading, workers must cover air vents, doors and windows with plastic flaps and turn off the heating, ventilation and air conditioning unit. Any items that cannot be removed from the work area should be covered in plastic as well. Respirator with a high efficiency particulate air (HEPA) filter. Ordinary dust masks do not protect from microscopic asbestos fibers. Each worker needs a half- or full-face mask with a HEPA filter. Air purifier with a HEPA filter. Setting up an air purifier in the work area reduces the risk of contamination. Disposable coveralls and gloves. Asbestos is hard to wash out of clothes. Workers should wear disposable coveralls or clothing that they plan to throw away when the work is finished. Pump sprayer filled with water. Keeping asbestos materials wet helps prevent dust from getting into the air. Workers should spray the flooring and any old adhesive underneath to keep it damp at all times. A solvent may be useful for dissolving old adhesive. Wet wipes or a HEPA vacuum. Workers should clean the work area and all tools with disposable wet wipes to avoid stirring up asbestos dust. Another option is to use a vacuum cleaner with a HEPA filter to trap dry dust. Sealable plastic bags for disposal. Many jurisdictions require asbestos materials to be collected and disposed of in specially designed and labeled bags. It is illegal to dump asbestos materials with regular trash. Qualified abatement professionals know how to dispose of asbestos properly. If you need to dispose of asbestos materials yourself, you must find a landfill or trash-pickup service that can accept asbestos. You may have to call to make an appointment in advance. Minnesota Department of Health. (n.d.). Floor Tile Removal. InspectAPedia. (n.d.). How to Identify Asbestos-Containing Flooring. Home Flooring Pros. (n.d.). Asbestos Floor Tiles – Everything You Need to Know.